I generally don't review cooking kits since I'd rather cook something from a recipe instead, but there are exceptions. Try as I might, I cannot make my own tamales from scratch taste quite as exquisite as the ones from Global Grub. I'm pretty sure it has to do with the mix of chiles in package. 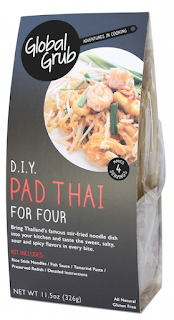 Which brings me to the lastest cooking kit from Global Grub, Pad Thai. It’s all about the ingredients. 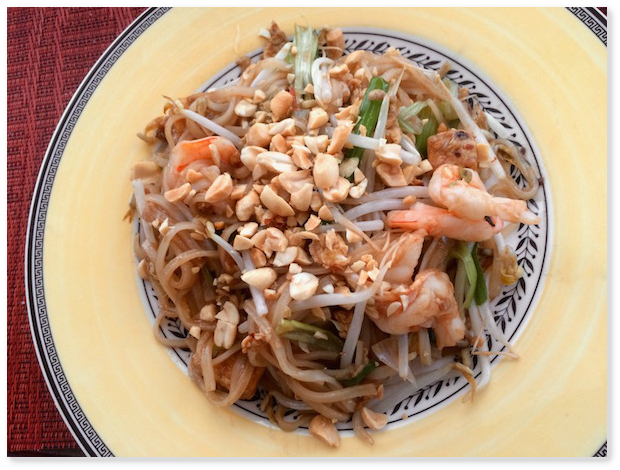 There are a lot of recipes for Pad Thai out there and more often than not they use ingredients that just don’t belong in it such as ketchup, rice wine vinegar or honey. For more authentic versions, check out the recipes in Pok Pok by Andy Ricker or Thai Street Food by David Thompson (which also includes the fascinating history of the dish).Or even easier, you can use the latest Pad Thai kit from Global Grub. Having tried the kit I can vouch for it. Along with rice stick noodles, the kit contains tamarind, fish sauce and preserved radish which you might not have on hand but make all the difference in this simple but satisfying dish. It tastes just like what you get in a restaurant not in a cheap kit or from making it without the right ingredients. The balance is right, but so is the texture and the toppings. I asked Carley Sheehy the founder of Global Grub how this kit came to be. “I’ve been infatuated with Pad Thai since I had a huge delicious plate of it in Thailand (for only a couple bucks). When I came back to the US, none of the Pad Thais could compare! I realized the Americanized version oftentimes uses ketchup instead of tamarind, which makes a big difference. I also realized what makes the dish extra challenging is the balance between sweet, salty, sour, spicy. It’s a lot of contrasting flavors to balance, plus everyone has their own taste/preference. So basically, I’ve been “studying” it for a long time and trying to perfect the recipe (over and over again). I also was lucky enough to have my brother go to Thailand last year where he officially learned to make authentic Pad Thai; he passed all his learnings to me. Give the kit a try, and let me know what you think! Disclaimer: My thanks to Global Grub for providing the kit for me to review. I used my own tofu, egg, garlic, shallots, bean sprouts, green onions, lime, roasted peanuts and shrimp to make the dish and was not compensated monetarily to write this or any other post on Cooking with Amy.